A while back I picked up a beat-up fabric book at the thrift store for 75 cents because it had a great 5.5″ circular mirror in it. I knew I wanted to cut that out and add it to Jax’s quiet book. Since he is a huge fan of brushing his teeth (he signs asking to do it, then hums the song I made up for him to brush to) I had to do a sink scene! The toothpaste and brush are attached by a ribbon inside the cup. The toothpaste tube actually slides on its ribbon and makes a crinkly noise. The toothpaste swirl is at the end of the ribbon so you can put it on the toothbrush. I didn’t want it separate or it would get lost. 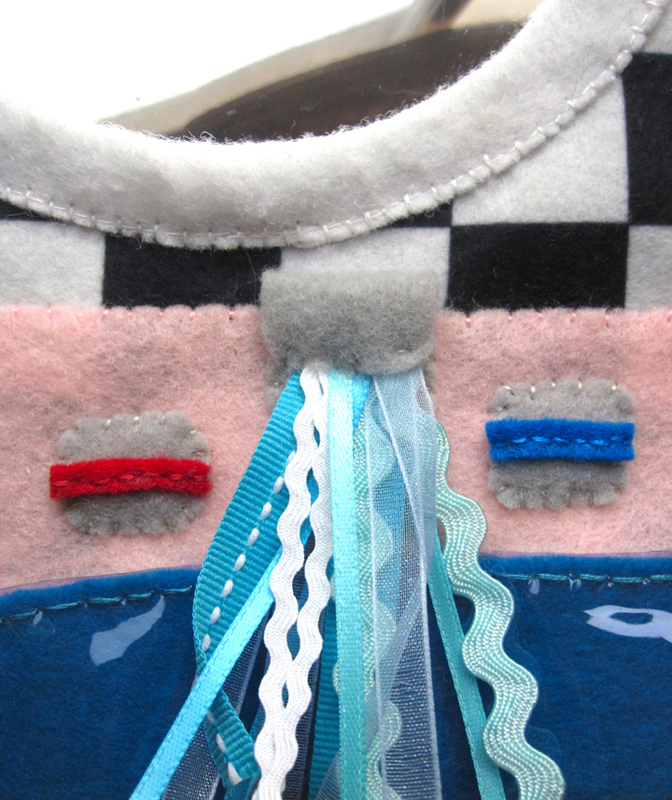 The water in the sink is a bluish vinyl from my scrap stash layer over aqua felt and the running water is a bunch of blue and white ribbon scraps. 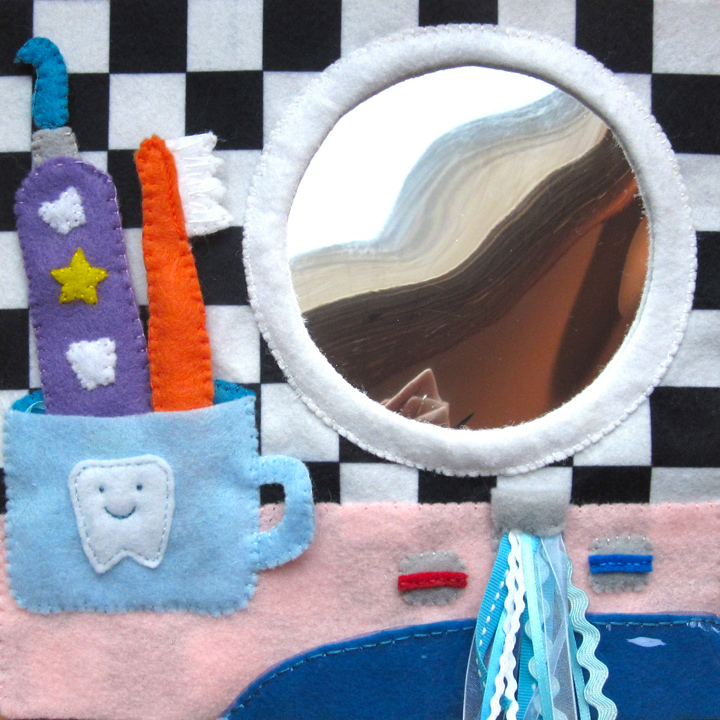 Here’s what I used: checkerboard printed felt background, kid-safe mirror cut from an old book, felt (in pink, aqua, sky blue, lavender, orange, red, blue, gray and white), ribbons and ric-rac, batting/stuffing, a crinkly cereal bar wrapper and embroidery thread to match. 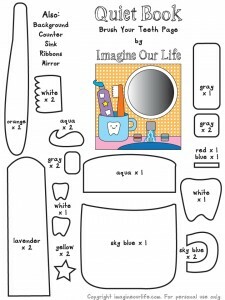 My pattern doesn’t include the counter or sink shapes since everyone’s pages are different sizes. Depending on what size mirror you are able to rind, freehand it to what fits your layout best. I did all the sewing by hand on this page (sewing machine time is rare in my house!) 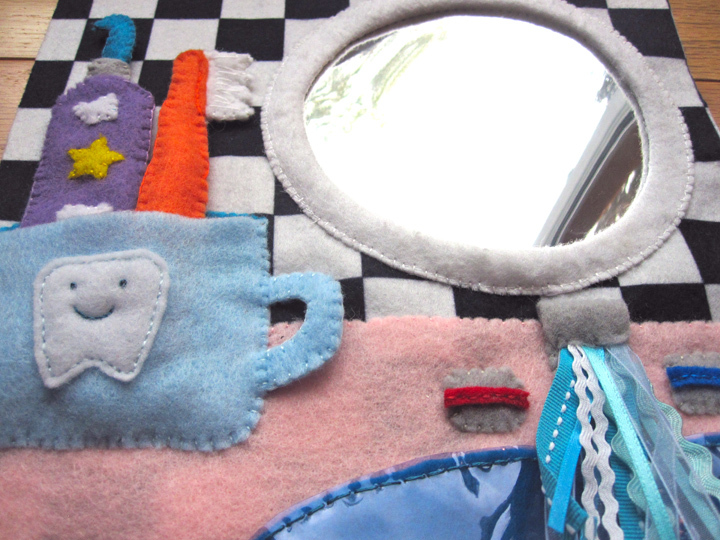 To start, I sewed down the counter, sink and mirror. I sewed the hot/cold stripes on the faucet knobs and sewed them down (you could make yours circles with buttons and have them turn if you want to get fancy!) I sewed the bottom 3/4 of the faucet on, then folded down the top. I folded a variety of ribbon scraps in half and stitched them into a bunch. I sewed them down under the fold of the faucet then stitched the edge down. Next was the cup. I sewed down the inner cup piece. 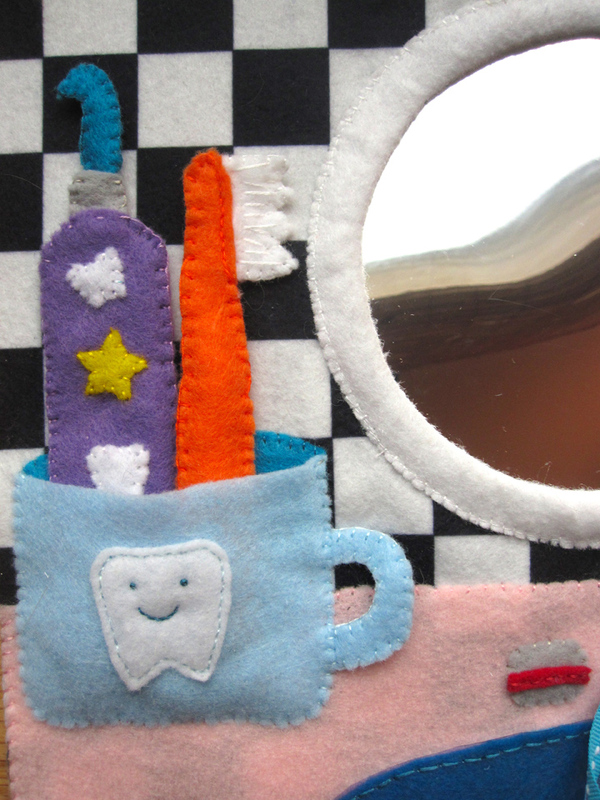 I made a smiley face on the tooth and sewed it to the cup front. I sewed the handle pieces together and pinned them in place. I took a long ribbon – long enough for both the toothpaste and toothbrush – and folded it in half. I stitched the mid-point down under where the cup would go. Then I just sewed the cup front on, leaving the top open to make the pocket. 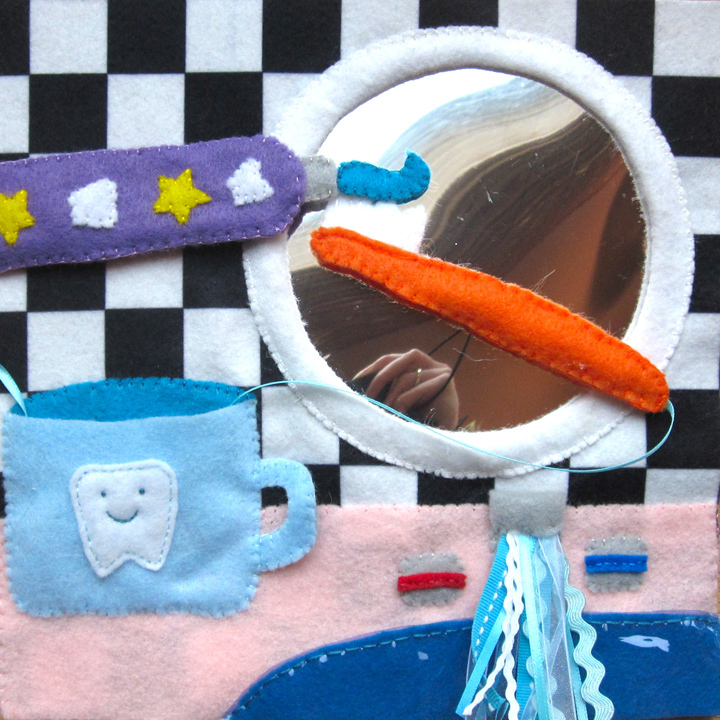 On the toothpaste, I sewed the teeth and stars to the front piece. I cut a piece of crinkly wrapper (mine was a Trader Joe’s cereal bar) to fit in the tube and put it and one of the halves of the ribbon in between the two sides. I sewed along the sides of the tube and along the bottom, but left a gap in the bottom-middle so the ribbon could slide. At the top, I sewed the grey cap pieces to each side of the toothpaste tube, then sewed them into a tube around the ribbon. At the end of the ribbon, I sewed the two halves of the toothpaste. I may add a stripe of glitter paint to the toothpaste if I have a color that works. For the toothbrush, the toothpaste bristles were sewn together then decorated with long stitches. I layered them between the two handle pieces along with some batting with the ribbon sandwiched at then and sewed it together. If you use this pattern, leave me a comment with a link so I can check your version out! This entry was posted in Crafts, Quiet Book, Sewing and tagged Free, Patterns, Quiet Book, Sewing on October 27, 2011 by Stephanie. Your quiet book pages are amazing. I’m blown away by the creativity and detail you put into them. 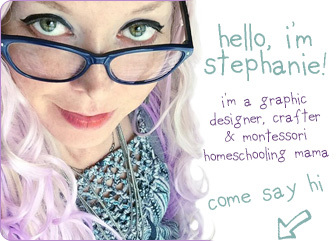 I am hoping to create my first quiet book soon, and am so inspired by your pages – thank you for providing the templates. 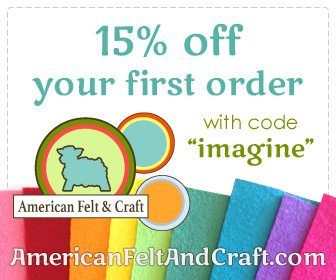 I hope to make some that are half as cute as yours! Do you sell these quiet books? I don’t have time to make them to sell, do to my full time job, but I’d love to one day! I love your quiet book pages! They are beautiful and so creative! Thank you so much for providing the templates. I have already started the sandcastle and beach bag page for my daughter and can’t wait to make more! Hello, I was wondering how you sewed down the mirror? My mirror is too thick for needles, obviously, so just wondered how you put it all down so the white rim would hold it in securely. Thanks for all your help. 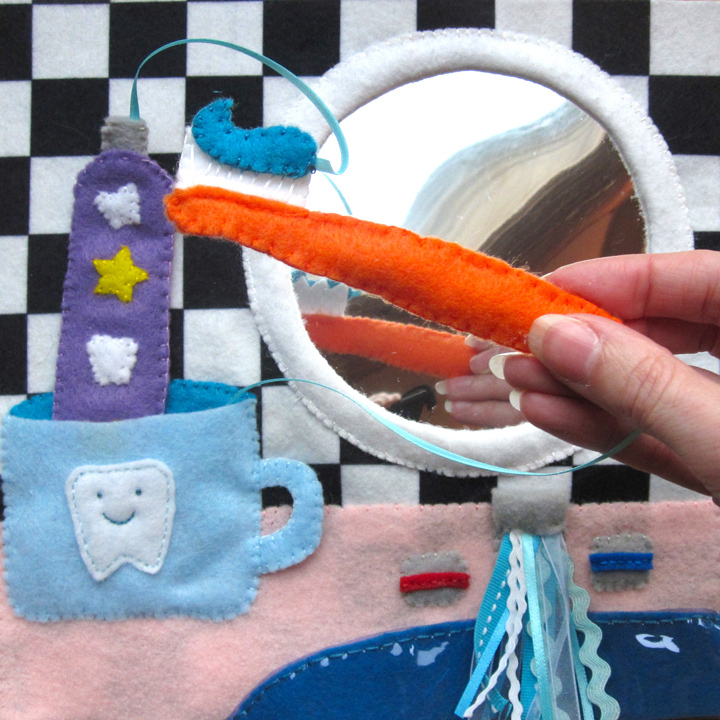 Heidi, what I did for my mirror was to glue the inner edge of the felt mirror frame to the top of my mirror using Beacon Gem Tac. (Regular tacky glue or hot glue will peel off.) I also glued the back of the mirror to the page. Then I sewed the outer edge of the felt frame to the background page. So far, it’s holding up very well. Hi there! I have a kids’ sewing blog and am working on a post showing how to sew a felt toothbrush roll for overnighters. I’d love to use the toothbrush in your template on the front of the roll, if I may. 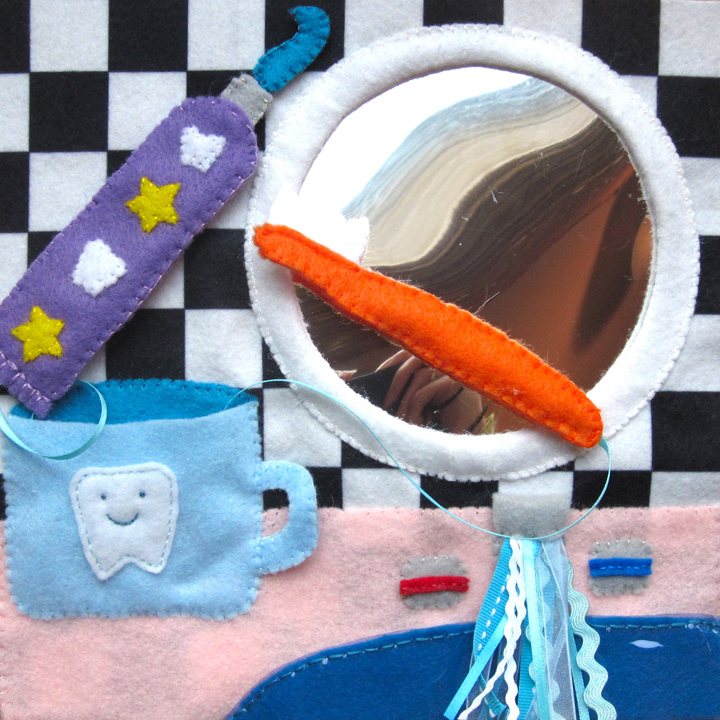 I’ve been wanting to make a page for my grandson where he can comb his hair and “brush his teeth” in a mirror. the mirror is the problem! i can’t find anything unbreakable that truly reflects. i may have to scour thrift stores for a book to cut up! I considered the inside of an aluminum can, foil, an emergency blanket, a mylar balloon…. omg so cool! I love this, really creative.